Yes this is the first thing that came to my mind when I grew some microgreens of sweet basil sometime back. I wrote an article about mangoes and this recipe in my monthly column at Exotica and this salad was repeated many times. You know the mango phalsa salad has been a perennial favourite and the Thai style mango and sticky rice keeps getting repeated in new forms in my kitchen. The ripe mango and red chilly dip is quick and easy with a dash of balsamic. 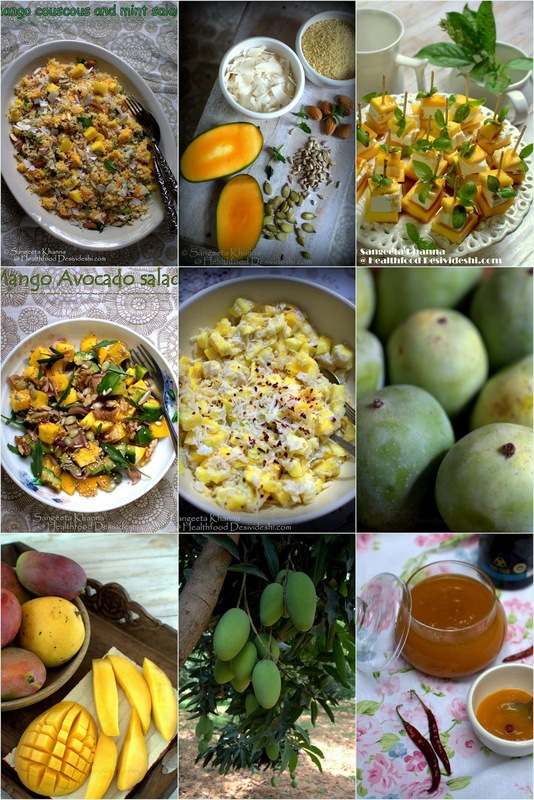 We love our mangoes so much we even make mango poha in various ways. Mango granola parfait is another breakfast staple during mango season. You might like the mango couscous salad or a mango red chilly dip that I make and use it like a salad dressing sometimes. You get the drift. This is how much we love our mangoes. And we eat them for meals on weekends, sometimes for week day dinners too. And no, mangoes are not fattening, just don't make them into a cake or a cheesecake please. But then there will be some better cheesecake recipes too. There are about 1000 varieties of mangoes in India and the total production of mangoes all over the country surpasses any other fruit by its sheer volume. There are many wild varieties of mangoes too but this is one of the first fruits that were grafted and bred for great taste and texture as the Mughal kings would reward anyone who developed a good mango cultivar for them. Mango growing competitions and mango eating competitions were common even in History. No wonder so many mango cultivars came up and have been preserved so well in the country. 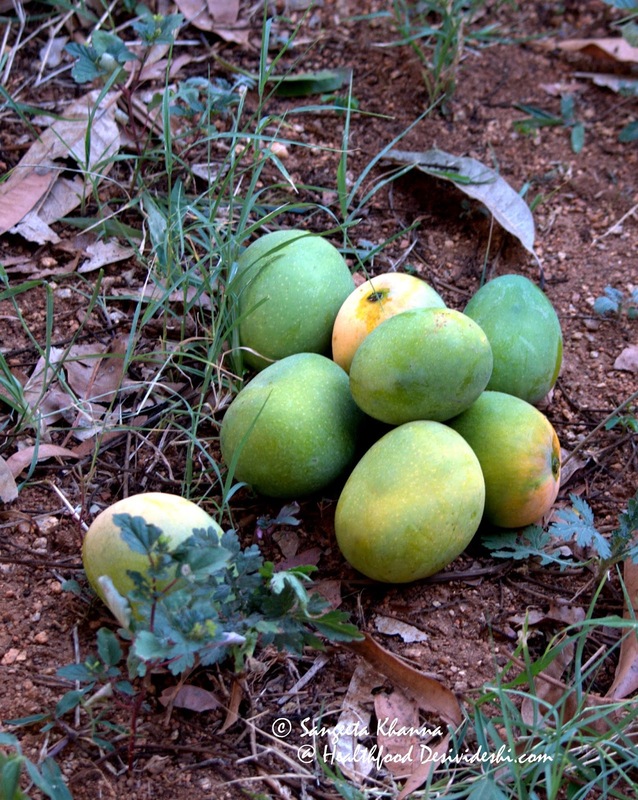 The lesser known mango cultivars could not become very popular in urban markets because of small fruiting season and faster rotting once the fruit is ripe. But locals always get the best of mangoes for themselves. Each region has a special variety and people go gaga over their love for their own native variety of mangoes. I have always loved Langda, Dusseri and Kesar but I can understand if someone swears by Benganpalli, Neelam or Alphonso, the mangoes grow over you and if you have been eating a variety since your childhood it becomes an absolute favourite. There is one more factor that makes us partial to the mangoes native to our own state. The mangoes plucked when ripened on the trees are the most flavourful and we get to devour such mangoes only within a span of 2-3 days as it starts rotting really soon. The tree ripened mangoes do not travel well and that is the reason why the native varieties of mangoes taste the best closer to their place of origin. So if we get Bengunpalli mangoes in the north we must understand that those were plucked from the trees premature and were bereaved of their optimal flavours that develop only when the stone of the mango is fully developed. The ripening hormone (phytohormone Ethylene) in the fruit releases only when the stone is mature in the case of mangoes. No wonder Bengunpalli tastes bland when we get them in Delhi and you never get a good langda in the south, until someone has planted a tree in a private orchard. The mangoes for long distance transportation are plucked early and they never get a chance to get ready for proper ripening. Eating local mangoes is the best bet when you want the most flavourful fruits, the next best way to savour the juiciest fresh mangoes is travelling to places where your favourite variety of mangoes grow in the season. You rarely get well ripened mangoes far away from their place of origin. I fondly remember the trip we took to Rataul last year with Suhail Hashmi just to eat mangoes from his native village in western UP, some 45 Km away from the capital. 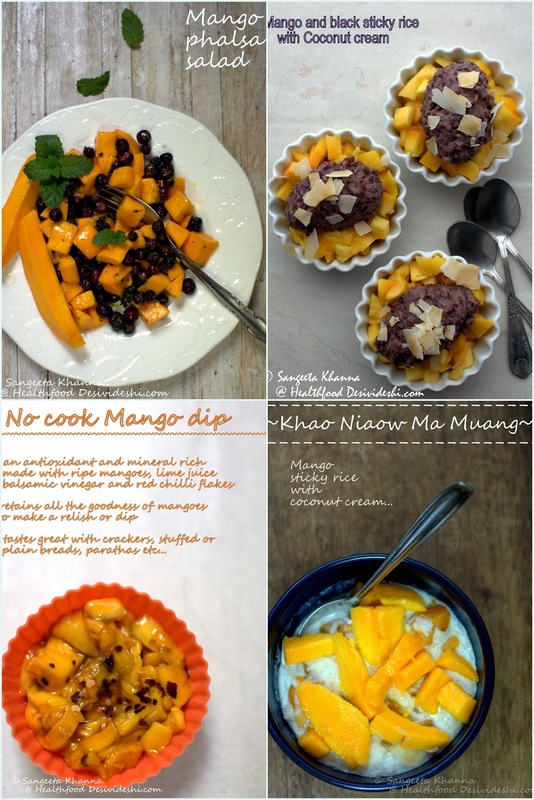 We are never tired of the ways we can eat mangoes. We eat them sliced we eat them juiced and we juice them in their own skin and drink smooth pulpy mango juice right out of the packaging nature decided for this luscious fruit. The juice straw sipped from cartons stands no chance once you have rolled a ripe mango between your palms, punctured the opening on the top and sucked the juice out of it. For many childhood years I wondered if the origin of the word ambrosia comes from sucking ripe juicy mangoes, somehow ambrosia and mangoes rhymed in my mango smitten mind and it became ‘mangrosia’ for me. Somehow in the modern sedentary world we started associating mangoes with weight gain unfortunately. While it is outright wrong, the mangoes are packed with nutrients that actually boost health. Rich in various antioxidants, vitamins and minerals, mangoes are the best food one can have during summer months. So much so one can have mangoes for a meal, make salads or even desserts. Imagine a salad that has mango in it wouldn’t need any packaged dressing or mayonnaise to make it tasty, the fruit itself is so delicious the salad would need just a few natural fresh ingredients to make a perfect bite. A mango basil and feta cheese salad mimics Italian Caprese in the choice of ingredients but ends up being far more delicious. 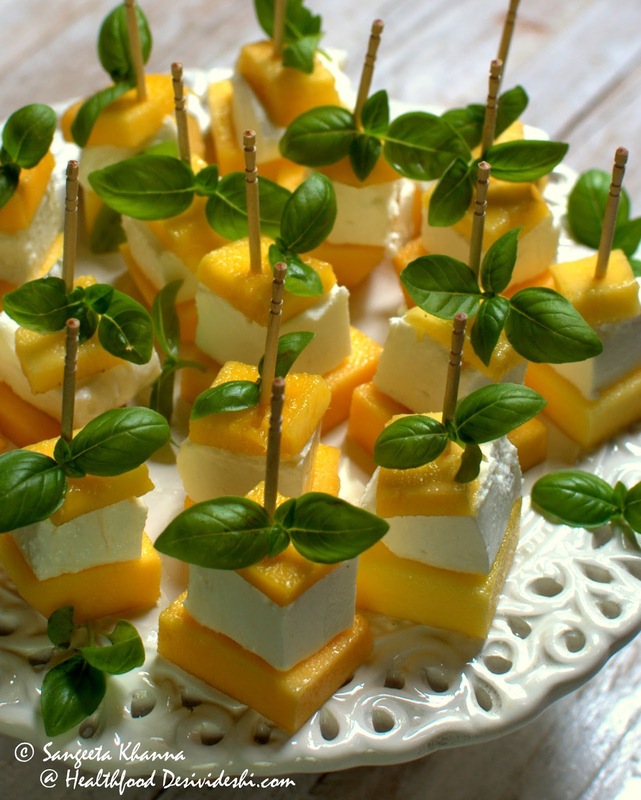 Imagine sweet luscious mangoes with a smither of feta cheese and fragrant basil micro greens. You don’t actually need a dressing with this salad but a drizzle of honey and balsamic mix lifts up the caprese to a new level. 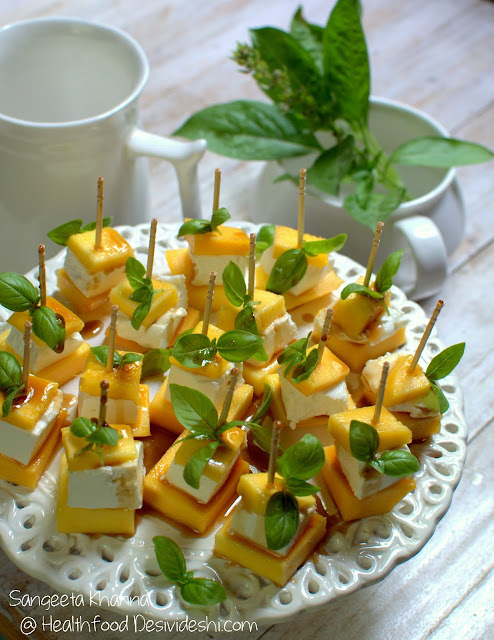 We are still getting some mangoes in our local markets and you might like to try this quick appetiser for a party. Please do let me know whenever you make this mango feta insalata. You can use regular basil leaves if you don't get basil microgreens.